Good evening, everybody! In my mission to use all my CSA produce, I’m finding myself trying a lot of new recipes. I got inspired to try lettuce wraps as a way to use the beautiful Bibb Lettuce I’ve gotten for the past two weeks (without making more salads). I also used the green onions and garlic from my CSA box this week, and organic, grass-fed ground beef from the Farmer’s Market at Howe Meadow. I made a cucumber salad as a side, and talked Laura into being my new recipe guinea pig! Turns out, this is a great way to use a lot of veggies. This recipe was for sure a keeper! The ground beef filling had some nice heat and good flavor, and the cucumber salad was a nice balance to the heat of the wraps. Definitely a recipe I’ll try again! By the time we finished all the lettuce cups and most of the filling, we both had full and happy bellies, and we were ready to go cool off in the pool for a bit. I may use the leftover filling in some kind of a hash, or stir it into some scrambled eggs for a savory breakfast (great ideas, Laura!) And Laura, thanks for alway trying my experimental recipes! In a medium skillet over high heat, brown the ground beef in 1 tablespoon of oil, stirring often and reducing the heat to medium, if necessary. Drain, and set aside to cool. Cook the onion, garlic and ginger in the same pan, stirring frequently until the onions are soft. Add the soy sauce, hoisin sauce, vinegar, and chile pepper sauce to the onions, and stir. Stir in green onions, sesame oil, and cooked beef; continue cooking until all the ingredients are warmed through. 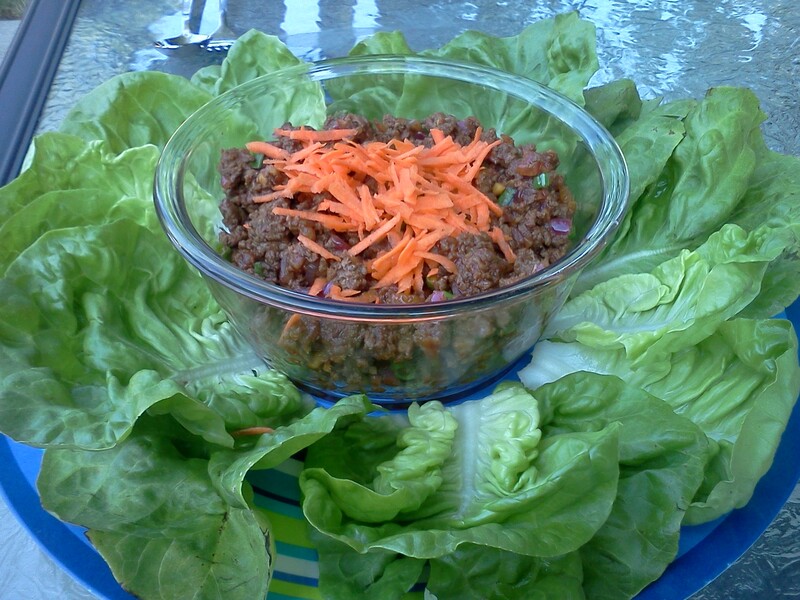 Arrange lettuce leaves around the outer edge of a large serving platter, and pile meat mixture in the center. Top with shredded carrots (or put carrots on the side and let each person add as needed.) To serve, allow each person to spoon a portion of the meat into a lettuce leaf. Wrap the lettuce around the meat like a burrito, and enjoy! This entry was posted in General on July 2, 2012 by Melissa. This was delicious! I will be your recipe guinea pig anytime! Thanks again. I’m glad it turned out well, because I didn’t have a backup dinner plan! This looked so lovely! I will definitely try this one! Thanks Melissa, so much for posting this, and thanks to Laura for trying it too! They were really pretty. I think next time I try it, I’ll add in some more veggies. Some chopped peppers or zucchini would have been great in there as well, I think. If you try it, let me know how it turns out! Sounds great! Crunchy, cool and savory! I think I will try this with soy crumbles. What a heathy alternative for a wrap! And the seasoning on this recipe might even disguise the taste of the soy! 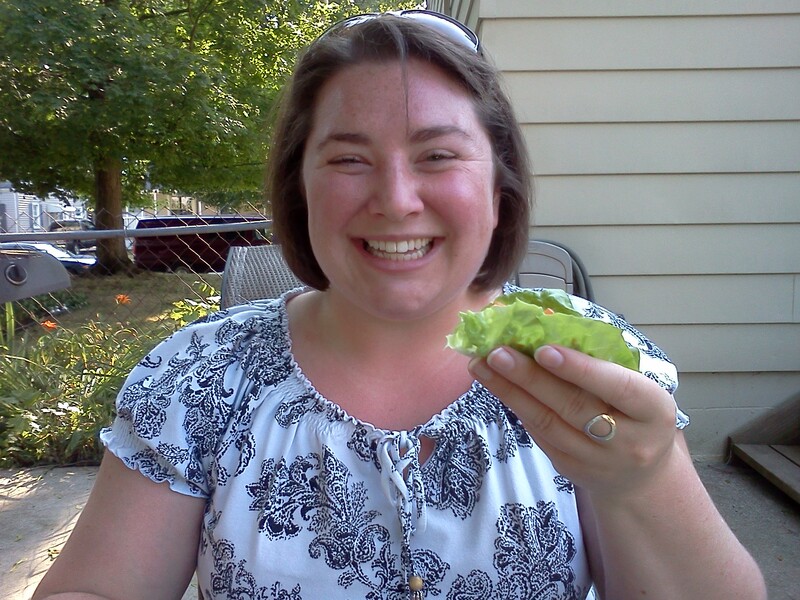 (Just kidding) I got some more Bibb Lettuce this week – I may try another version of a lettuce wrap just for fun.